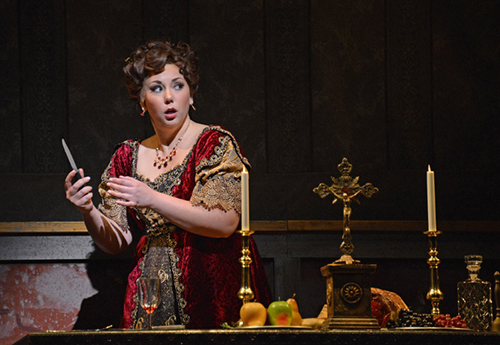 This season the Baldwin Wallace Conservatory alum returns to The Metropolitan Opera to perform the title roles in Puccini’s Tosca and Cilea’s Adriana Lecouvreur. It also marks her debut with Maggio Musicale Fiorentino, singing Leonora in Verdi’s Il trovatore. And when she’s not traveling to opera houses around the world, Rowley serves as BW’s 2018-2019 guest Artist-in-Residence. On February 15 at 7:00 pm, Rowley will return to her alma mater to present a concert of bel canto scenes and songs with pianist Jason Aquila in Gamble Auditorium. On Saturday, February 16 at 4:00 pm in Fynes Hall, Rowley will work with students during a master class. Both events are free. The soprano’s mantra of always being prepared has served her career well. A quick internet search revealed the following headlines: “Jennifer Rowley to Replace Elena Stikhina at Opera De Paris” — “Jennifer Rowley Replaces Anna Netrebko in Tosca” — “Jennifer Rowley to Replace Maria Agresta in Il Trovatore.” Rowley seized each of those moments, so it’s no wonder that “being prepared” is her number one piece of advice for young singers. Did Rowley see herself having an international career as an opera singer when she entered BW? Not at all, she said, but her thoughts changed overnight when, with the support of the Ohio Arts Council, she was invited to study at the Instituto Superior de Arte del Teatro Colón in Buenos Aires the summer between her junior and senior years. Published on ClevelandClassical.com February 11, 2019.